The refreshed SKUs of the GTX 1080 featuring 11Gbps memory are still trickling out onto the market. We've already seen one from Aorus, and now we have our second courtesy of Asus. We've actually already reviewed the original GTX 1080 Strix OC, but for this newer SKU Asus has strapped a newer and even larger cooler to the card (as seen on its GTX 1080 Ti Strix OC), so this isn't just a case of there being faster memory plonked into an older design. 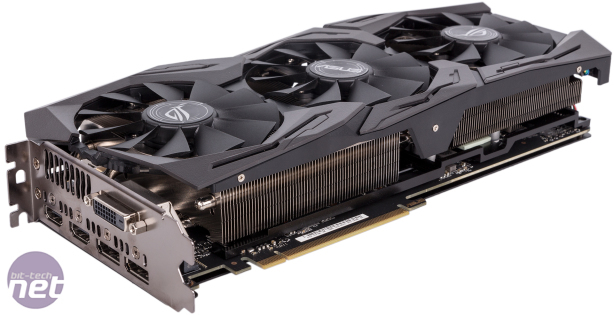 The new GTX 1080s so far seem to be immune to the price drop Nvidia announced for the GPU back in February. 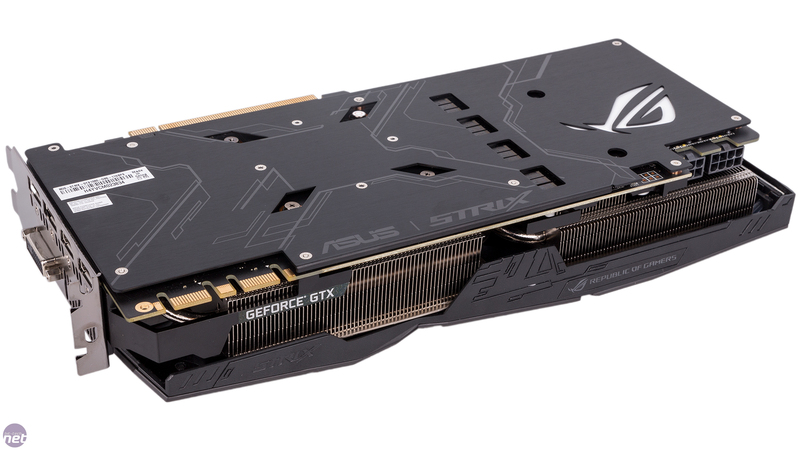 That, plus the usual premium demanded of an Asus Strix card, means that this is far from the cheapest means of obtaining a GTX 1080, as there are numerous third-party offerings at or even below the £500 mark. Of course, Asus will argue that it has enough features and performance to justify the extra outlay, but £600 certainly seems like a lot given that the GTX 1080 Ti can be found for £630-£650, with the upper side of that price bracket even including cards with third-party cooler designs. The card is supplied with a dual 6-pin PCI-E to single 8-pin PCI-E adaptor cable and a couple of Velcro cable ties, but the real star of the show is of course the card itself. 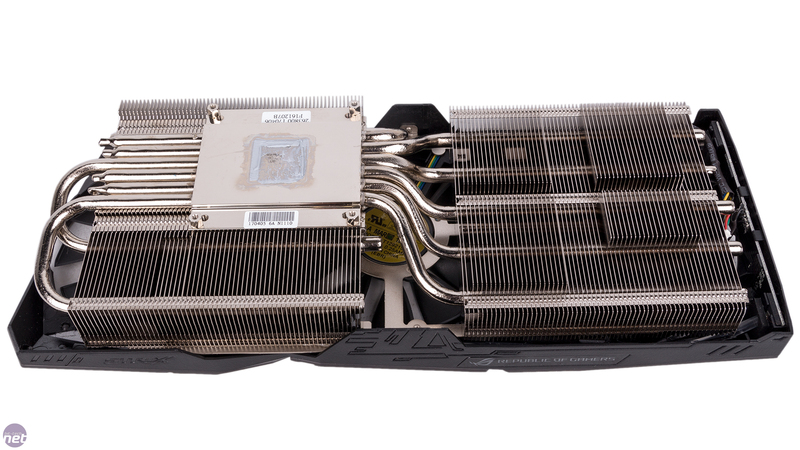 It's an absolute beast – not only is it almost 300mm long and significantly taller than the PCI-E bracket edge, but the cooler has been swapped from the old dual-slot design to the new 2.5-slot one, meaning it'll proudly occupy three expansion slots. 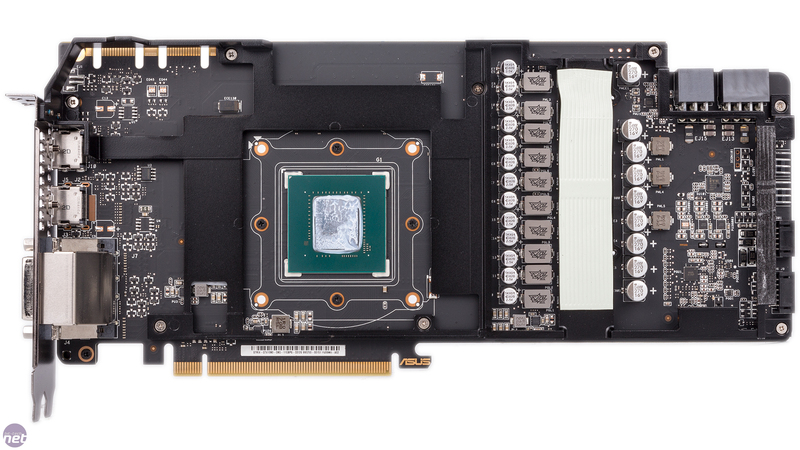 You'll also need to ensure suitable PCI-E slot spacing if you're hoping to go the SLI route. Like most, Asus has adopted customisable RGB lighting into its high-end GPU designs, and this card is no different. 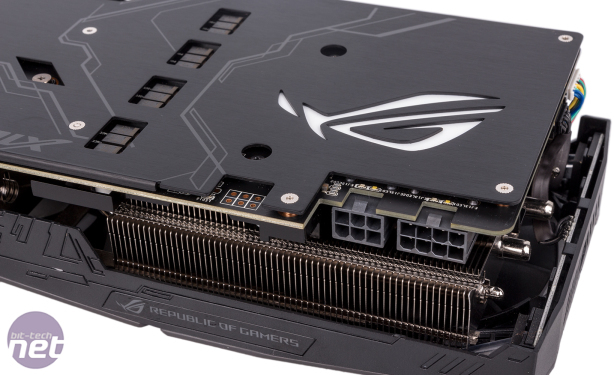 Where Asus is sensible, however, is in keeping the card all black and silver, meaning that all colour is user-chosen and comes from the lights themselves. 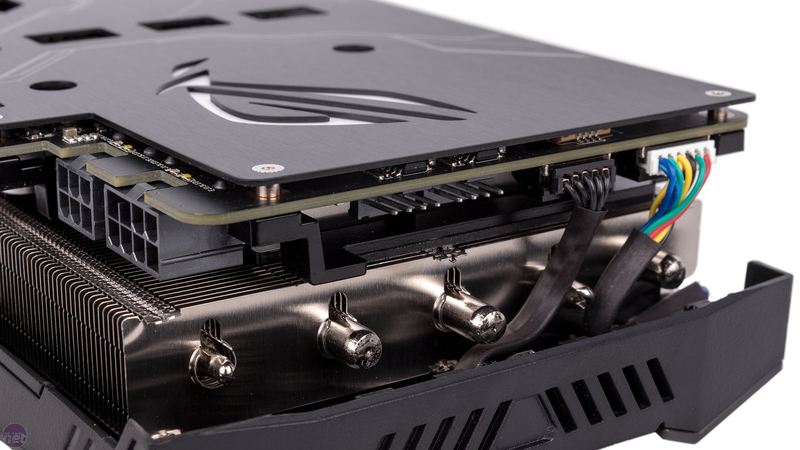 We think the Strix design, while massive, looks rather nice, and the thick metal backplate (a must-have feature for a card this bulky) really helps here. The backplate has its own RGB lighting, which is great since this is what most will see through a standard case window. The front fascia of the cooler shroud also has plenty of RGB bling, and these lights also illuminate the ROG logo along the top edge. The LEDs are controlled through the Asus Aura Sync software, meaning they can be synchronised with other compatible hardware. The default base clock of this card is 1,696MHz, which is disappointingly slower than the original GTX 1080 Strix OC where it sat at 1,759MHz. 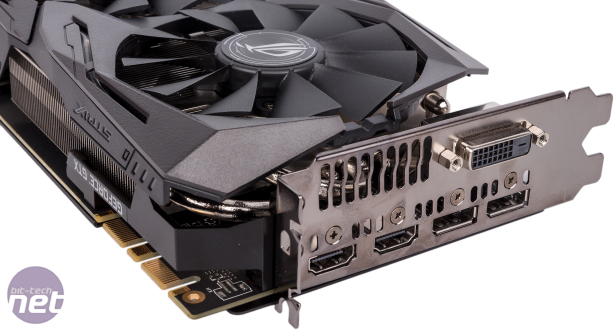 That card seemed to have permanently low stock, however, and eventually Asus released the GTX 1080 Strix Advanced with the same cooler and features but lower clocks; this new card clocks in slightly higher than that one. Either way, 1,696MHz is a 5.5 percent increase over stock speeds and gives us a boost clock of 1,835MHz. Switching to OC Mode in Asus' GPU Tweak II software, meanwhile, raises clocks to 1,721MHz base (1,860MHz boost), which is a seven percent increase over reference. This mode also gets a 110 percent power limit setting to alleviate clock speed limitations further. Lastly, a Silent Mode is available, which drops clocks to 1,671MHz (1,810MHz boost) and reduces the power limit to 90 percent. The 11Gbps memory, meanwhile, is fixed at this speed in all but OC Mode, where it is bumped ever so slightly to 11.1Gbps. An 8-pin PCI-E connector is joined by a 6-pin PCI-E one, and these are sensibly indented on the PCB to make way for power cables – the card is tall as it is. Asus here implements its VR-friendly display outputs where one DisplayPort is swapped for a HDMI leaving you with two of each alongside the regular dual-link DVI-D header – a sensible move for a card of this calibre, which is easily powerful enough for VR. The new 2.5-slot Strix cooler design is said to provide 40 percent more area for heat dissipation compared to the previous dual-slot one. 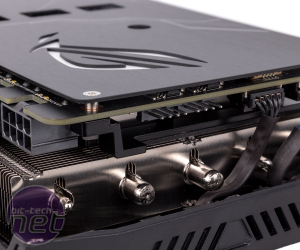 It also sees Asus move to a copper baseplate for the GPU rather than direct heat pipe contact, with Asus claiming that its MaxContact technology gives up to twice as much contact with the GPU surface compared to 'traditional heat spreaders'. All of the copper is nickel-plated for a consistent finish, and the baseplate feeds six heat pipes that pass through two separate stacks of fins. Meanwhile, a metal contact plate draws heat away from the GDDR5X memory chips and MOSFETs, with extra thermal padding connecting this in turn to the main heatsink. A trio of Asus' Wing-Blade fans cool everything down, only switching on when the GPU is at 55°C or above. These fans have IP5X certification, which means they have a decent level of protection against dust ingress. The open shroud design means that most of the resultant hot air will end up in your chassis. A feature related to the fans that we rather like is FanConnect II, essentially a pair of four-pin fan headers at the far edge of the PCB to which you can connect case fans (PWM and DC fans are both supported). You can then tune these based on either the GPU or CPU PWM signal – a neat way of giving you finer grained control over system cooling. The PCB is made using Asus' Auto-Extreme technology, meaning the production process is 100 percent automated, flux-free, and in theory more reliable. 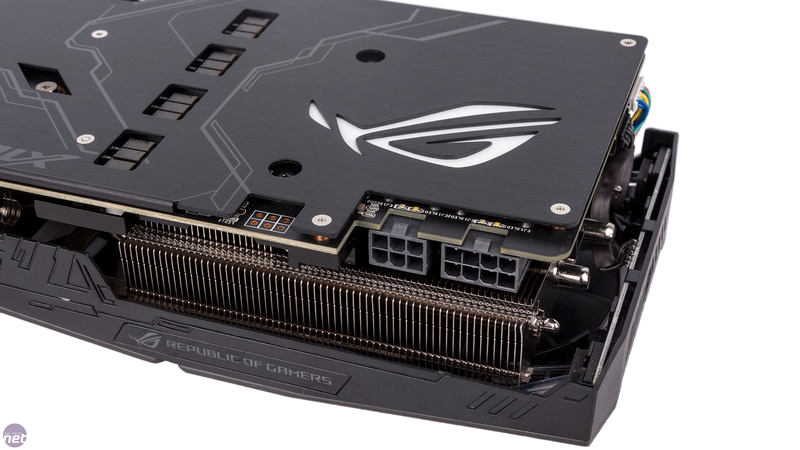 Asus uses its own Super Alloy Power II VRM components for the hefty 8+2 phase power design too, and these are said to boost efficiency, reduce heat output and power loss, and improve overclocking potential.